This is a 1947-53 Chevrolet hub cap for our Hot Rod Steel wheel. This vintage Chevy hubcap has an 8 1/4 inch back diameter. 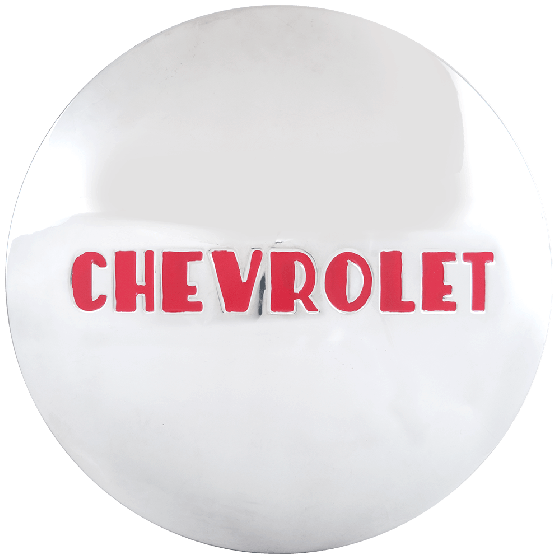 These authentic vintage Chevrolet hubcaps are designed to fit our Hot Rod Steel wheel. Please check your actual wheels required cap fitment size. Check the cap mounting diameter of your Gennie wheels. If it is 8 1/4", this cap is compatible. If not, let us know what you find and we may be able to supply another compatible cap. Are these chromed steel? If not, what are they? These caps are polished stainless steel.